This non-technical trail is a great training ride through spacious pine forests. Practice shifting up and down in your second ring on Powerline’s signature smooth rollers – sometimes steep, but often times mellow. The first stint of Powerline trail off Saddle Road forks immediately. 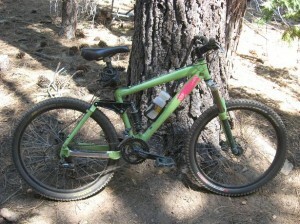 The right-hand fork offers a quick climb up to an open, sandy apex, where one can gawk at an overwhelmingly picturesque backdrop of Desolation Wilderness peaks. The trail then descends for a short, yet steep, dusty spell and curves to the left to begin following the overhead power lines which parallel Pioneer Trail. The left-hand fork travels away from Pioneer Trail, hugging bouldery knolls as the trail climbs higher up onto a pine-shaded mountainside. Both forks merge at the Al Tahoe turn-off. The first bailout point, if starting from the Saddle Road trailhead, is at Al Tahoe Road. A marker indicating a right turn will place you on a sandy zigzagging path that dumps out onto Pioneer Trail at its intersection with Al Tahoe. Stay straight for more of that undulating singetrack, which beginning mountain bikers’ dream of. The trail twists and turns, climbs and descends, through sagebrush, manzanita, storybook forests, and over Cold Creek’s wooden bridge to High Meadows Road. Turn right onto High Meadows Road for a paper flat gravely avenue to a left-hand turn onto Powerline’s continuing singletrack. As a side note, one can embark on intersecting High Meadows Road or Cold Creek trail, in the eastern direction away from Pioneer Trail, for a punishing climb out-and-back to Star Lake. The singletrack widens into a dusty double-lane Powerline Road, caked with whoop-de-doos from dirt bikers. Powerline Road passes left-hand Cedar trailhead and Corral trailhead, eventually bleeding out into a dirt parking lot at the corner of Fountain Place Road. 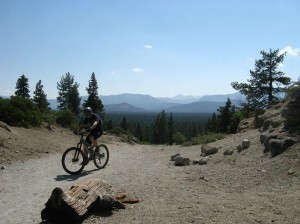 Fortunately, Powerline trail is one of the best marked mountain biking trails in South Lake Tahoe. 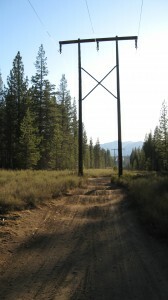 At every crossroads, there is a trail marker indicating the direction one needs to pedal to stay on Powerline trail. Because of its parallel nature to Pioneer Trail, many locals use Powerline as a commuter path to-and-from work. South Lake Tahoe residents can hop on at Oneidas, High Meadows Road, Cold Creek trail, and Al Tahoe, to link up with Powerline trail.